Container Design – Beth MacFawn Landscape Design Inc.
Beth enjoys designing and planting containers for both residential and commercial projects. To brighten an entry, patio, deck, or other outdoor space, she uses a variety of plants and unique containers overflowing with colors and textures. Utilizing grasses in container gardens creates eye-catching interest during the long winter months. In designing your container, Beth considers the aspect of the sun as well as the architecture and building materials, and will find distinctive containers for outdoor spaces. Have a pizza oven or grill? Beth will create an herb container garden from which you can pick fresh herbs to spice up your cooking creativity. Like succulents? Beth enjoys using a variety of drought tolerant sedums to create a diverse color pattern in containers. Building a new project? Beth will incorporate an irrigation zone that is specific for the containers around your home or office. 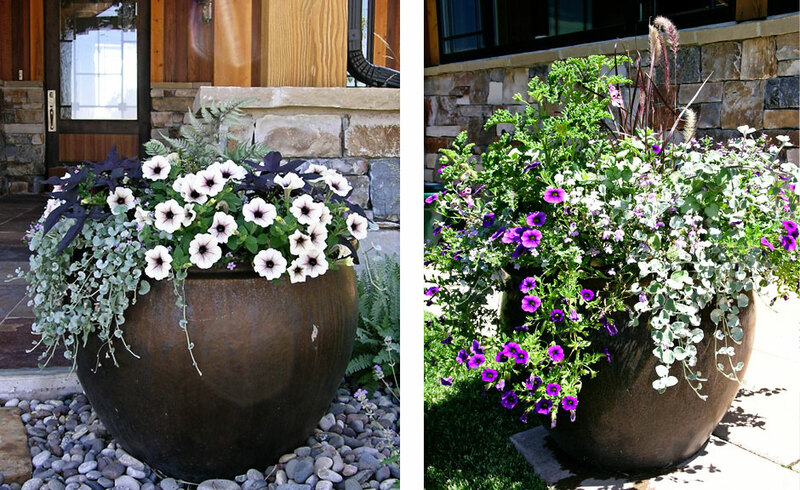 During the design process she will specify irrigation infrastructure; for example, a sleeve within stonework or concrete work allows containers to be irrigated on a separate zone within the irrigation controller so you can have beautiful, thriving containers throughout the season, without the watering can, or to return to after a vacation.